Instructions: Create a 6 x 6" card base from white paper. Cut a piece of paper from the Buttons and Blooms Paper Collection 5 3/4 " x 5 3/4 " and adhere to the card base using Dries Clear Adhesive. 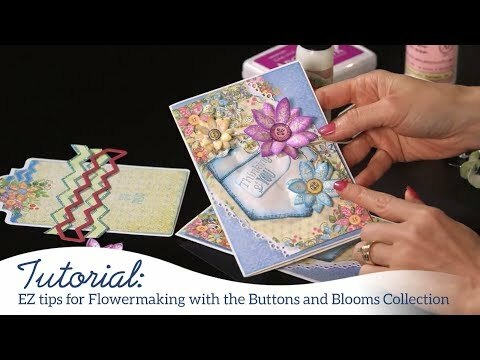 Choose second layer paper using the Buttons and Blooms Paper Collection. To create pocket, use paper from Buttons and Blooms Paper Collection, chose zigzag pattern stamp using Patchwork Pocket & Patterns Cling Stamp set. Stamp with Ranger Archival Ink Pad - Garden Patina and cut with matching die from Patchwork Pocket & Patterns Die. Adhere to the card base using 3d foam tape. To create birthday sentiment, stamp Hand-stitched Accents Cling Stamp with Ranger Archival Ink Pad - Garden Patina ink, cut using the coordinating dies and adhere to the card base using 3d foam tape. To create flowers, stamp Buttons and Blooms Cling Stamp on foam paper with Ranger Archival Ink Pad - Garden Patina ink and cut using the coordinating dies. Colour with Memento Dye Ink Pad - Lulu Lavender ink. You will need two petals for each flower to create flowers. Colour buttons with Ranger Archival Ink Pad - Garden Patina. Use an iron or heat gun to heat the petals and then shape using your fingers. Sponge the petals with dries clear adhesive and sprinkle with Ultrafine transparent glitter. Layer the petals together using the hot glue gun making sure to offset them. Use a paper piercer to make a hole in the middle and pull through the black stamens from the Bright Bead - Medium set. Add a little hot glue to the underside of the flower to adhere. Sponge the petals with dries clear adhesive and sprinkle with Crystal Ultrafine Transparent Glitter and Rajni Chawla's Crystal Clear glitter.